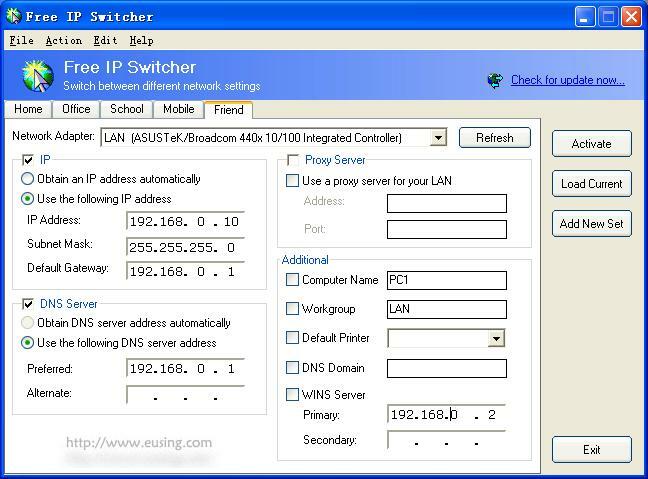 Free IP Switcher is a very useful utility when you change your network settings under different locations. Free IP Switcher switches between preconfigured network settings with a single click and without any reboot. With Free IP Switcher you can automatically change all network settings on your pc: IP address, network masks, default gateway, dns server, wins server, proxy settings, default printer and more. ...... Don't waste your time reconfiguring computer network settings every time you change your location. Free IP Switcher is a perfect solution for you. Free IP Switcher switches between preconfigured network settings with a single click and without any reboot. With Free IP Switcher you can automatically change all network settings on your pc: IP address, network masks, default gateway, dns server, wins server, proxy settings, default printer and more. Qweas is providing links to Free IP Switcher 2.1 as a courtesy, and makes no representations regarding Free IP Switcher or any other applications or any information related thereto. Any questions, complaints or claims regarding this application Free IP Switcher 2.1 must be directed to the appropriate software vendor. You may click the publisher link of Free IP Switcher on the top of this page to get more details about the vendor.